Team Sky domestique Wout Poels has required surgery to fix a broken bone in his shoulder, suffered in a crash that ended his Flèche Wallonne race last Wednesday. The Dutchman went down with 40km to go in a crash that also knocked teammate Lars Petter Nordhaug out of the race, An initial diagnosis indicated no broken bones, but further inspection revealed a break near the shoulder. 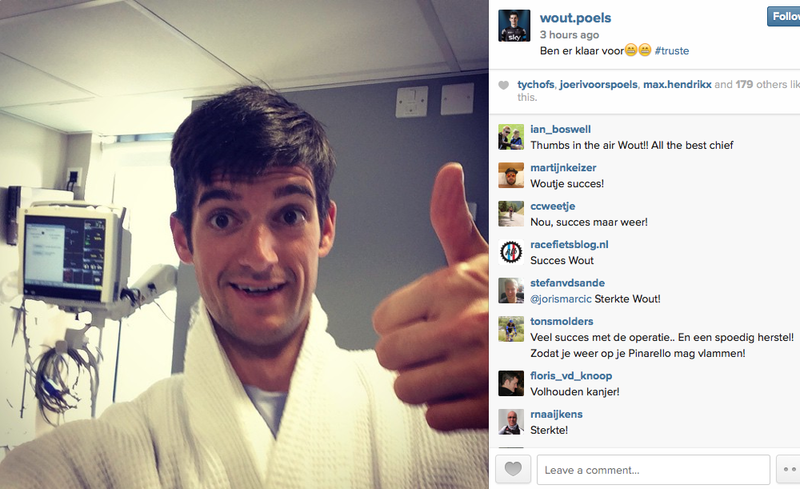 Poels, who won a stage and wore the leaders jersey at Tirreno-Adriatico in March, tweeted a picture of him in a hospital gown and promised to be back on his bike soon. Teammate Nicolas Roche described Poels’ incident in his column in the Irish Independent. “With 48km to go, and the break’s lead down to a minute and a half, Lars hit the deck in a crash that forced Belgian favourite Philippe Gilbert to abandon the race,” he wrote. The injury has forced Poels out of this week’s Tour of Romandie but is scheduled to support Chris Froome at the Tour de France this summer.